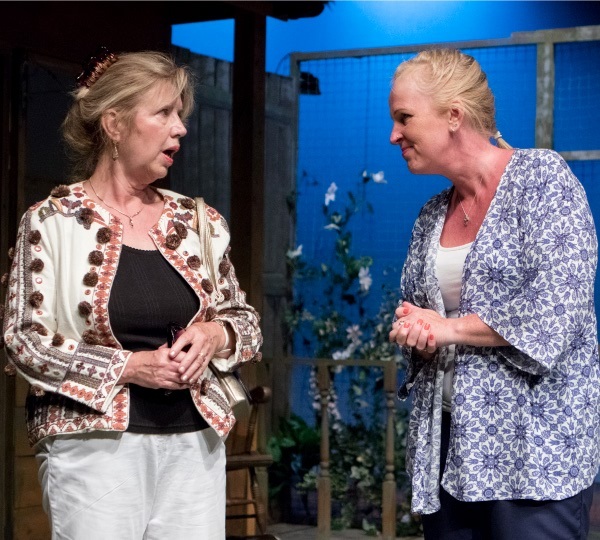 Alan Ayckbourn’s plays are usually middle-class comedies about marriages, relationships and life behind the lace curtains of suburbia, Ford Cortinas and later Audis on the drive, with the laughs riding over a hint of darkness lurking in the background. But Snake in the Grass is different, this is a comedy right enough, but of the darkest hue from the off. It is the follow up to Ayckbourn’s ghost play, Haunting Julia, which had a cast of three men with the ghostly Julia. Here we have sexual balance restored with a cast of three women, with the presence of a dead father hanging over proceedings. Shortly after the death of her father, Annabel Chester has returned to the family home after 35 years living in Australia, “Tasmania, actually,” she tells everyone, as if that is the posh end of down under. She didn’t get on with her father, nor does it seem she is able to get on with anyone else as she is brought to life in the more than capable hands of Valerie Tomlinson. 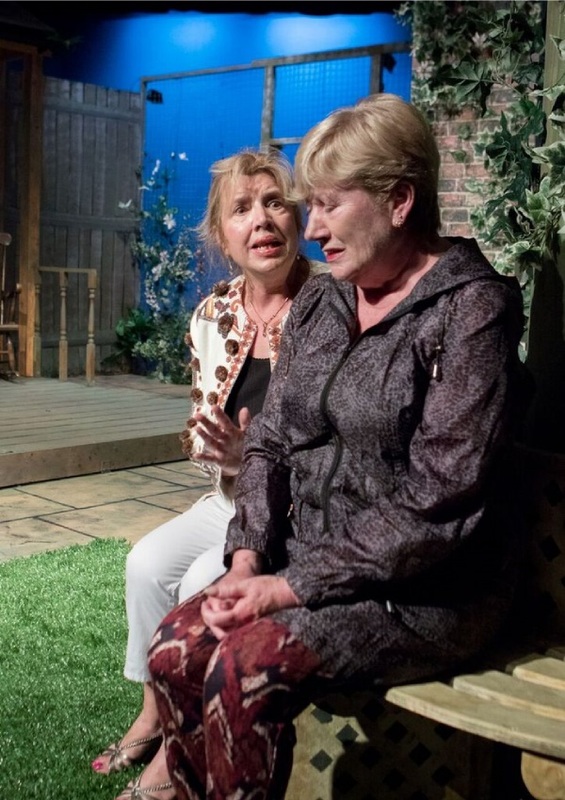 Annie – “only father called me Annabel” - can rub anyone up the wrong way and seems to take delight in correcting, criticising, belittling and generally demeaning her sister Miriam, played with delicious wickedness by Denise Phillips. Miriam was the bubbly one, the fun loving younger sister and the one who stayed behind and became her father’s nurse, tied to him and the house for 15 years as her life and his ebbed away. And then, the final ignominy, father left house and estate to the estranged daughter who had run away to escape him all those years ago. Our haughty, and now rich, ex-pat arrives home, jet-lagged and jaded, to find Alice waiting for her, Alice, the nurse sacked by her sister for more reasons than you could shake a P45 at; Alice, the aggrieved nurse, with enough evidence to make Miriam a guest at her Majesty’s pleasure; in short - Alice, the brash, no-nonsense, northern blackmailer. The evidence suggests that father’s recent demise might have perhaps have had a little, should we say, encouragement, from Miriam, a modicum of help, here and there. The evidence is flimsy, to say the least, or it would have been had not Miriam sort of, well, admitted it to Alice . . . “I panicked!” being her excuse to Annie. Pip Olliver plays Alice with a lovely mix of sarcasm and wit, with a steely core demanding cash or a visit by HM constabulary homicide (dead bodies the finding of) division. Her put downs are a joy as Annie stands firm that she is not paying the blackmail demand. All of which leaves the sisters with a dilemma; cough up the outrageous demand and become penniless; get Alice to accept a much . . . much lower payment; let Miriam go to jail or . . . well, there is always plan B. And on top of it all father’s body might well be six feet under but has all of him gone with it, as the tennis court in the garden reveals a mind of its own. 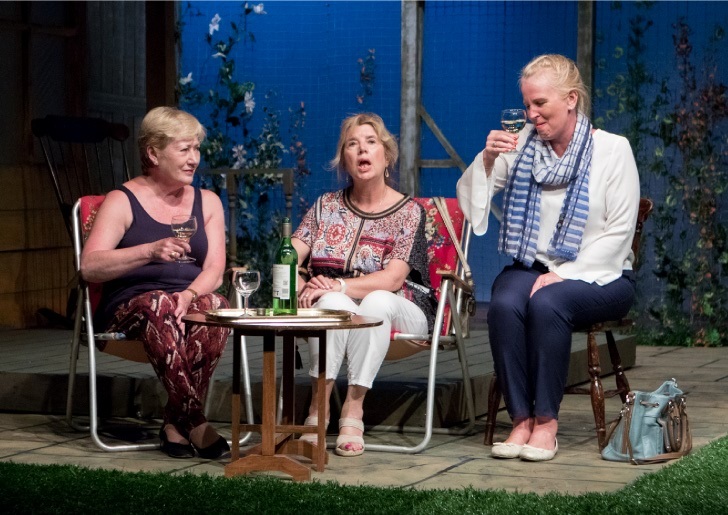 It is a play with a lot of laughs, some more nervous than others, with the comedy at times as black as night, with three actresses all on top form. There is the rather silly and childish, on the face of it, Miriam, but cross her and that façade fades to reveal quite vicious fangs and claws. She is someone you feel who has been messed with enough. Then there is the oh so superior Annabel, the sensible one, who cannot resist trying to be the controlling big sister - in everything, including blackmail. Except as the night goes on we discover both have their secrets, their ghosts, the their past abuse, past fears. Alice is no-nonsense, call a spade a spade unfairly sacked nurse with not so much a bone to pick as an entire carcass to collect with a way of making herself heard. The three show spot on timing, making sure no laugh, or important fact is lost and they bounce off each other like the mysterious tennis balls on the otherwise empty court. It is all leading up to the twist at the end, then the twist after that, then let’s twist again as the curtain falls. Director Rob Phillips keeps the tension growing well among the laughs building up the plot to the final shiver at the end. Malcolm Robertshaw has designed another excellent set, a summer house in the garden by the tennis court with a giant tree with circular seat around the trunk to add interest to this three-hander. Marrion Chittenden and Andy Wilkes have done an intelligent job on lights, with a highlight (not a pun) a scene with a slowly setting sun as dusk approaches and a gradually reddening sky. Tony Reynold’s sound of birds had its moments as well, such as the sudden complete silence that descends as one horror is revealed. Hunting Julia (1994) was a tense ghost story, about a father idolising his brilliant musician daughter who committed suicide. He is convinced her ghost still haunts her house. This play (2002) is darker but tempered by some delightful black humour, and later, in 2008, after his stroke, Ayckbourn returned to his ghostly theme with the more whimsical Life With Beth, with a dead husband still trying to control from beyond the grave, a play which he saw very much in the Blythe Spirit gentler comedy mould. Together they made up Ayckbourn’s trilogy, Things that go bump.